The highly-anticipated fight between Floyd Mayweather and Conor McGregor did not disappoint. Check out our blow-by-blow analysis. Floyd Mayweather promised his fight against Conor McGregor wouldn't go the distance—and he delivered. Money notched a 10th-round TKO against McGregor on Saturday night in Las Vegas. McGregor asserted his physicality in the first three rounds, but eventually tired out, playing into Mayweather's trap. From there, the legendary boxer made quick work of McGregor, attacking him endlessly with combination after combination. Eventually, it became clear that Mayweather was hunting for a knock-out, teeing off on McGregor's head with one punch after another. Going into the 10th, McGregor was running on empty and Mayweather could smell blood. He landed a few more head shots before McGregor, woozy and wobbly, was saved by the referee who stopped the fight. Scroll down for our blow-by-blow analysis of the fight. In his post-fight interview, Mayweather admits that McGregor was a tougher opponent than he expected. But he also said he executed his game plan flawlessly, allowing McGregor to wear out in the early rounds, fire all of his big shots, then fatigue down the stretch. Mayweather turned on the gas the final few rounds, finishing off McGregor after the fighter had long been running on empty. Said Mayweather of McGregor: "He’s a lot better than I thought he was. He used different angles. He was a tough competitor. But I was the better man tonight." McGregor said he wished the ref had let the fight keep going, saying he was only fatigued. "I thought it was a little early of a stoppage," he said. As for Mayweather, McGregor praised the boxing star but also didn't sound over-the-top impressed with his opponent. "He was a lot more composed under the shots," he offered. For more analysis of Mayweather's 10th-round TKO, click here. It's over! Money Mayweather is the champion! 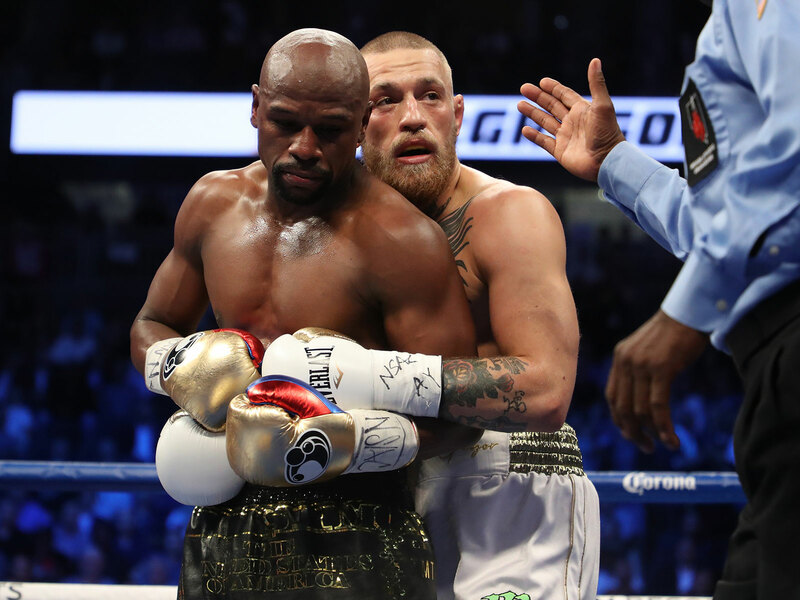 Mayweather and McGregor embraced in the middle of the ring and exchanged "pleasantries" (hey, they're boxers) and embraces. Everyone is rich and gets to go home happy! What a flurry! Mayweather is absolutely going for the KO. With McGregor slowing down, Mayweather is going all-out, swinging for McGregor's head time after time. McGregor has absolutely nothing left. The only thing saving him are clenches and the clock. He can barely stand up. But Mayweather is after blood! He's chasing McGregor around the ring. Keep in mind, McGregor has never been knocked out in a UFC fight. I'd be stunned if McGregor makes it through another round. Winter is coming. That was our closest round yet. Both McGregor and Mayweather appeared to gain second winds. Why am I giving the edge to McGregor? Because the other guy is 49-0, he shouldn't be in Round 8 against a guy who is 0-0. Whether McGregor wins or not, this has been an incredible showing. Another big round for Mayweather. He got the crowd on its feet at one point after knocking McGregor around the ring. The UFC star looks absolutely gassed at this point, grabbing on to Mayweather and locking up several times to catch his breath. He's still connecting on a handful of shots, but Mayweather's are far more frequent and ferocious. Money is cruising. Have Mayweather up 4-3. Fight has turned. Hell of a fight tho. I'd watch this again. The momentum is swinging heavily in Mayweather's favor. McGregor looks fatigued. After all, the UFC only has five rounds and we're in Round 6. Mayweather was on the attack most of the round, with McGregor's flashes coming less frequently in this round. McGregor is going to need to make something happen quickly for him to win this fight. Mayweather is going to pick him apart if this trend continues. We're getting deep into this fight, which most analysts predicted would be a bad thing for McGregor, but he's managed to stay respectable so far. He's definitely more winded than Mayweather, as the 49–0 champ continues to attack and McGregor treads water as the fight wanes on. One thing is clear: McGregor is in Mayweather's head to some extent. Floyd just pushed Conor in the chest after the bell had sounded. ​The intensity is picking up! 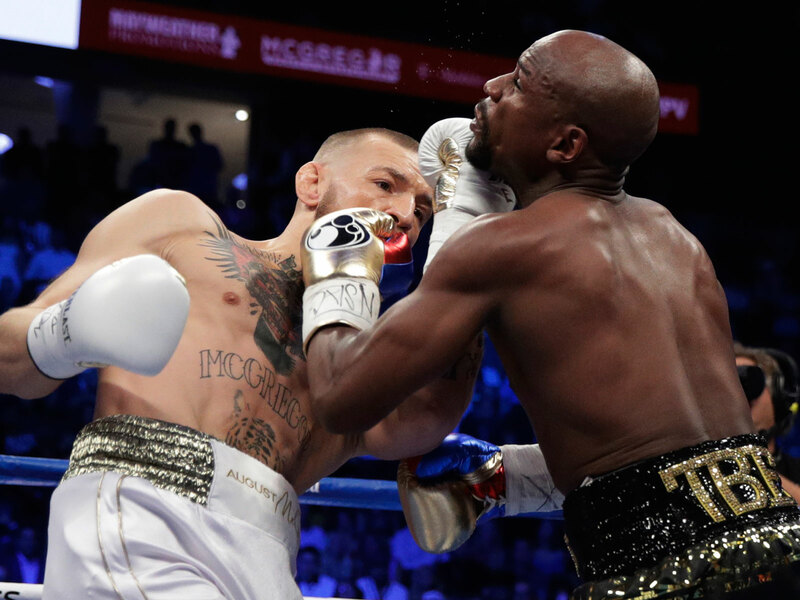 Both McGregor and Mayweather had their moments in the fourth, notably a left hook by McGregor and several impressive combinations by Mayweather. After being passive in the first three rounds, Mayweather started to stalk McGregor in Round 4, forcing him to back-pedal on several occasions. The crowd is responding after any shots landed by either side. Four rounds in, there's no question this fight has already delivered. Floyd's best round but I give it to Conor. 40-36 after 4. Uh, oh. McGregor keeps punching Mayweather in the back of the head, leading the ref to break things up. Despite an impressive start, those types of illegal punches could wipe everything away. His jab continued to be a weapon, landing several shots to the head on Mayweather. Until Mayweather wakes up, McGregor's going to continue to outpoint him at this rate. Round two was pretty much an even split. McGregor continued to assert his physicality, bodying Mayweather and landing several strong jabs. Floyd countered better in the second round, landing his share of punches on McGregor as well. Still, this is McGregor's fight so far. Despite his bravado, he's a patient fighter. We’ve got a fight! Mayweather and McGregor spent most of the first round sizing each other up, but they had an equal amount of impressive flashes. McGregor landed several good punches on Mayweather, visibly to Floyd’s surprise. McGregor gained confidence quickly, at one point putting his arms behind his back to taunt a timid Mayweather. All things considered… I think, McGregor…won…that…round?! He was the aggressor and set the tone. Mayweather might have just been taking notes, but he didn’t show much. He's holding back for the time being. OK, McGregor and Mayweather just touched gloves in the middle. Surprisingly civil. Mayweather looks like he's barely taking this seriously. He's so calm it's somehow disrespectful. I love it. HERE WE GO! Both McGregor and Mayweather are in the ring! Things are about to get started! Check out Conor's walk out to the ring here. IT'S LIT. Floyd Mayweather's walk-out outfit is insane. He's wearing a full black ski-mask and dressed head-to-toe in black and gold. He looks like a stone-cold killer. That is some outfit. Speechless. McGregor has started walking to the ring! He's wearing the Irish flag as a scarf, a brand-new buzz cut and a mean mug. The final odds on Mayweather-McGregor. Still time for drunk handshake bets with friends! 90: % of bets placed that have Conor winning. 82: % of the total money bet that has Floyd winning. Things are happening! National anthem time. More updates (as we wait), rapid-fire style! And it's ovah! 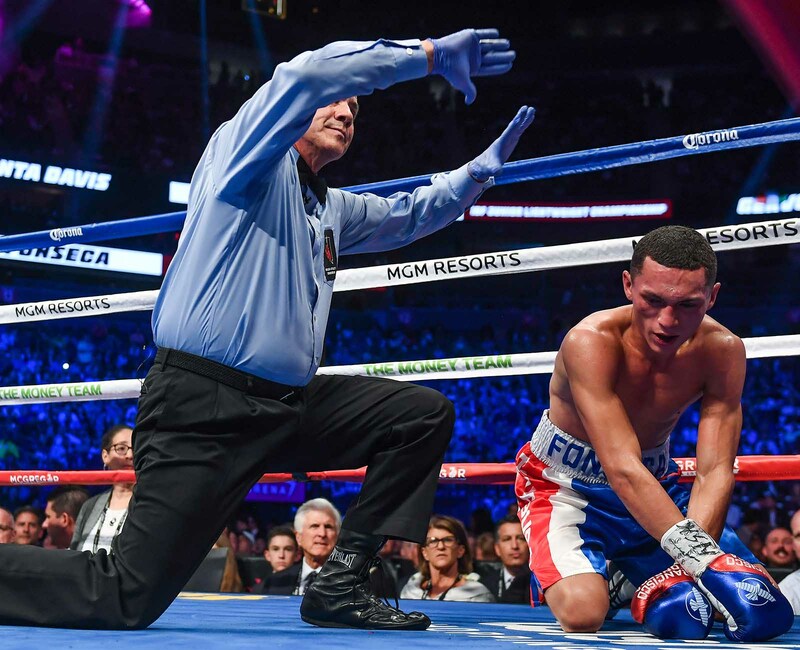 Fonseca gets knocked to the ground and can't get up before the 10-count. Davis won with an overhand left-handed punch that connected with the back of Fonseca's head. He then pushed him down to the ground to boot. But, the ref missed it. And Fonseca was declared the winner (KO, Round 8). Good sign of things to come tonight! Also, if your PPV is messed up, you are not the only one. Here's the latest info on the Mayweather-McGregor delay. We'll keep you posted. There's been late action on McGregor. The drunker everyone gets in Las Vegas, the more they're convinced McGregor has a chance. More info on the delay below. Davis-Fonseca still going on. ESPN's Sal Palantonio reporting that they are delaying Mayweather-McGregor fight to deal with PPV issues. 1) One of the PPV commentators claimed Fonseca used to milk 50 cows every morning before taking a two-hour bus ride to the gym. Also, Manny Pacquiao is making news! The celebrities are rolling in! Celebrity sightings so far: Bruce Willis, Robert Kraft, Jeff Gordon, Don Cheadle, Nick Cannon, Aisha Tyler and Cedric the Entertainer. Mayweather-McGregor won't come to the ring before 1130 ET. Opening bell about 1155. Follow @kevini for live action. Best in business. Sports Illustrated is live on the Mayweather-McGregor red carpet! Go check out the Facebook Live stream right now. Hurry! In other news, Badou Jack just scored a technical knock-out vs. Nathan Cleverly in the fifth round (full results here). Our wishes for a quick fight were granted. like mcgregor, i, sadly, weigh 17 pounds more than i did yesterday. #cupcakes. 1) McGregor is going to weigh around 170 pounds by fight time, according to Ariel Helwani. McGregor weighed in yesterday at 153, while Mayweather came in at 149.5. Mayweather’s list of advantages are long, but Conor could have 20 pounds on him in the ring. 2) McGregor is going to have to play "dirty" to win. If he tries any UFC stunts he faces a seven-figure penalty, so don’t expect him to break any rules. Instead, expect him to play within the rules like Charles Oakley and Ndamukong Suh play would within the rules. 3) The longer the fight, the more likely Mayweather is to cruise to a decision. McGregor has said numerous times he doesn’t’ expect the fight to go more than four rounds, but maybe that’s because he doesn’t think he has a chance beyond that mark. McGregor clearly can’t outbox Mayweather, so an all-or-nothing approach might be his best approach. It'd also be the most entertaining. Annnnnnd the Nathan Cleverly-Badou Jack undercard is underway. I think I speak for everyone when I say we're all rooting for a quick fight. Twelve rounds feels excessive. Oh, look! McGregor has arrived. No one is getting left at the altar tonight. Hey, fight fans. SI.com's Matt Dollinger taking over for the rest of the night. We're still waiting on Conor McGregor to arrive inside the arena. Thankfully, we have 362 undercards to help pass the time! Get it while it's hot, people. If you think $35 is steep for a t-shirt, first of all, remember that this is your chance to own a piece of history... and then maybe ue your last few bucks to buy an overpriced beer to weep into. Make sure to save a few bucks for the roulette tables, folks. WE HAVE A FLOYD SIGHTING. HE IS IN THE BUILDING. Also, it's been confirmed that McGregor weighs "in the vicinity of" 170 pounds for tonight's bout. It's a star-studded event: JR Smith is in town, folks. Give our folks on the scene a follow for all the updates and sights coming from Vegas: Maggie Gray, Ben Baskin, Kenny Ducey and Mike Dyce. The fighters weighed in last night... now it's your turn. Everybody knew this fight would bring in the money, and it literally has already started to. One bettor at the South Point Hotel, Casino & Spa made the latest million-dollar wager on the bout... in cash. We're still a good five hours or so away from the main event kicking off and the excitement is already apparent. For instance, SI’s Ben Baskin took a look at Friday’s weigh-in—a raucous, Irish flag-laden crowd that was very much in Conor McGregor’s corner. • Is Mayweather-McGregor risking boxing's best chance at resurgence? • Many doubt Conor McGregor can hang in the ring with Floyd Mayweather. His trainer disagrees. • Roundtable: Mayweather-McGregor elicits a variety of opinions. The highly-anticipated fight between Floyd Mayweather Jr. and Conor McGregor is finally here. What started as a seemingly preposterous idea will come to fruition on Saturday at T-Mobile Arena in Las Vegas. McGregor, not traditionally a boxer, will try to shock the world by handing Mayweather, 40, his first defeat. Whether the fight lives up to its billing remains an open question. Mayweather is a heavy favorite. But the event will undeniably be a spectacle, with countless celebrities expected to attend and millions of people set to watch on television. The main event is officially scheduled to get underway around 11 p.m. ET on Saturday, when the competitors enter the ring. Follow along with SI.com on Saturday night as we break down the big fight.